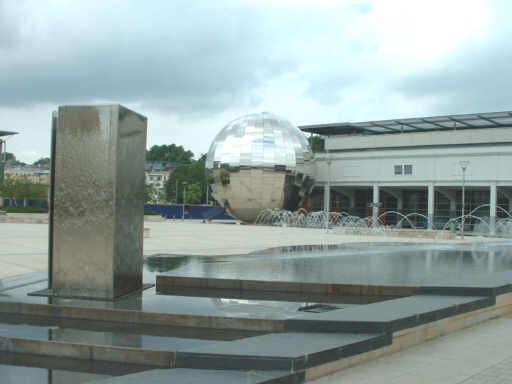 This visit to Bristol started with me parking in the underground car park under Millennium Square, so the first photo is of the Square. 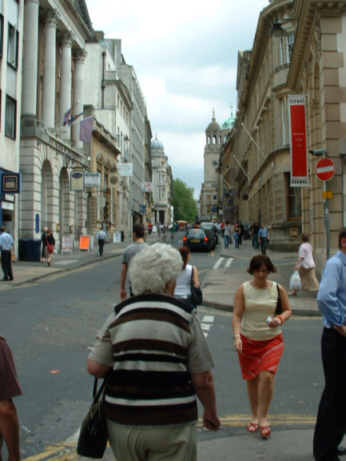 Much around here is new since I lived in Bristol, but much is the same. 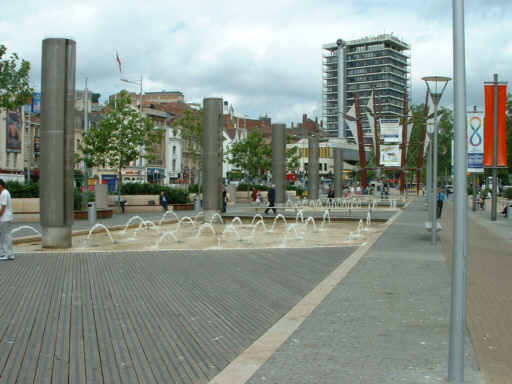 Two more recent views of Millenium Square. 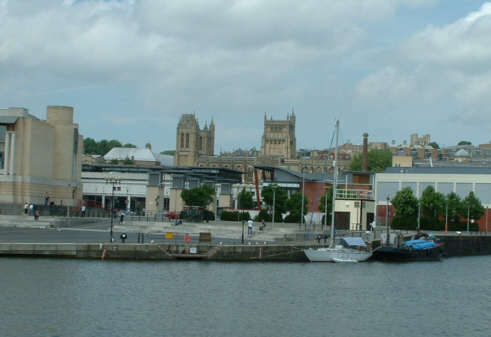 Looking across the Floating Harbour to the Industrial Museum. 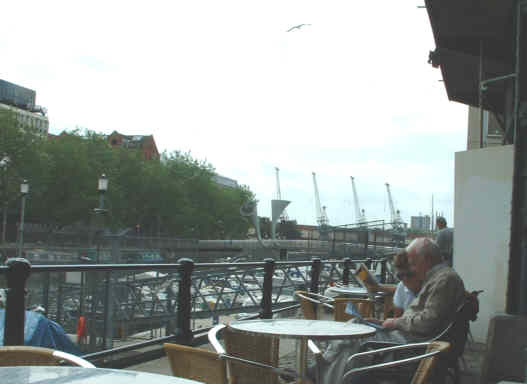 Nearby is the Watershed, converted warehousing now housing cafés and bars, this is the view from a table outside one of the cafés with the cranes outside the Industrial Museum in the background. Standing up I got this photo of one of the ferries that ply the Floating Harbour. 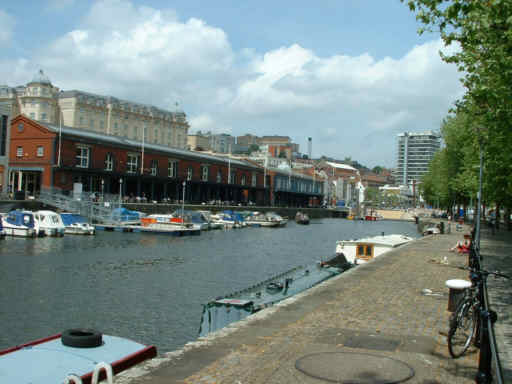 These old docks were developed along the Rivers Avon and Frome, St. Augustine's Reach, this part of the Harbour, was originally the River Frome - and the river does still enter it but most of the flow is taken by a flood channel under Clifton Downs! Looking the other way is the centre of the City. 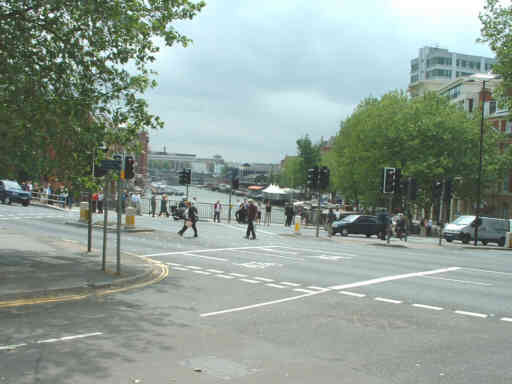 On the left is where the River Frome emerges from its culverted passage under Broadmead and the Centre. Turning round again, looking down the length of the Reach. 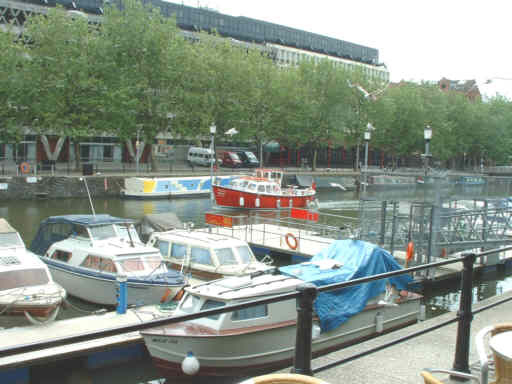 The docks were formed by building locks across the river further down, they were in commercial use until the '60's but are now given over to leisure - a function they fill very well. 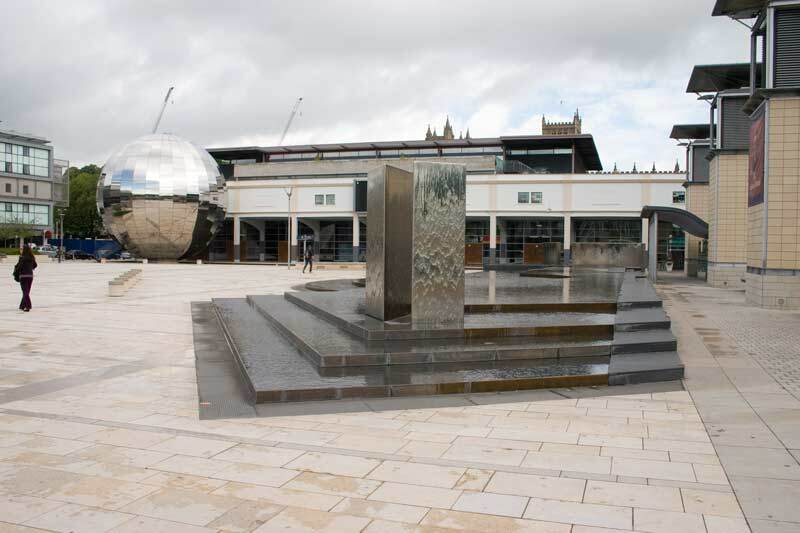 The Centre itself has changed a lot recently, instead of grassy "traffic islands" in a dual carriageway the traffic has been rerouted and this water feature has taken the place of the old "Tramways Centre". 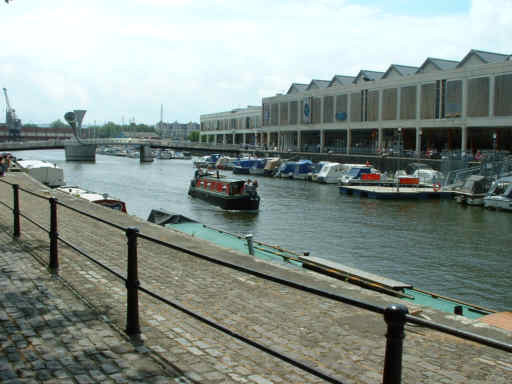 The River Frome flows under this area, much of which has been "roofed over" over the years, the Quayhead moving steadily down stream in the process. Business then took me into the commercial centre, this is the view up Corn Street towards the Corn Exchange at the top of the slope. 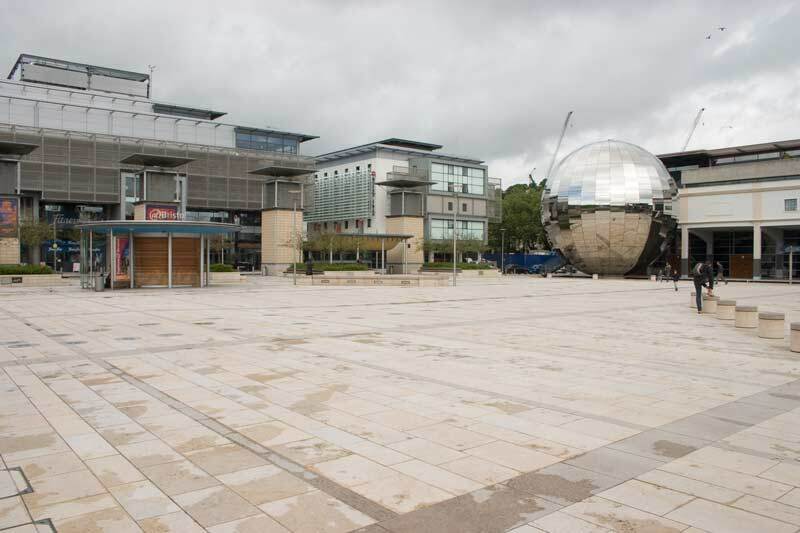 This area is less changed than the nearby shopping area, Broadmead, which was all rebuilt after WWII. Ever wondered where the expression "pay on the nail" came from? Well this is one of the nails outside the Corn Exchange on which deals used to be paid for. 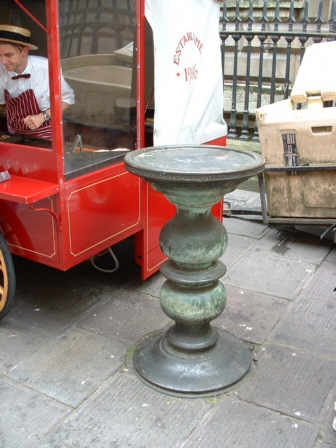 The sausages from the stall next to it were nice as well ! 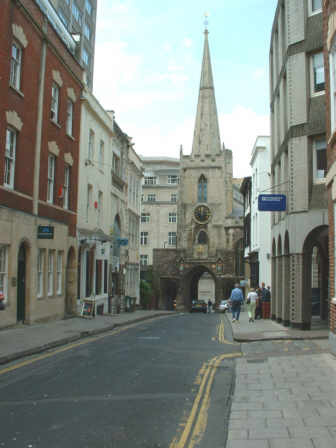 This is Broad Street in the old centre with the old church atop one of the old City Gates at the bottom. 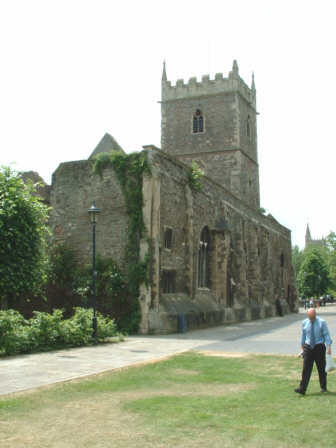 This old bombed out church is left as a memorial to the blitz victims, it stands in Castle Park, once the site of Bristol Castle, later the main shopping area it was destroyed by bombing during the blitz. 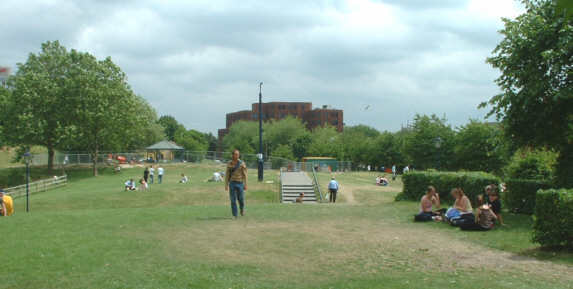 Castle Park is a lovely place to have your lunch on a sunny day. 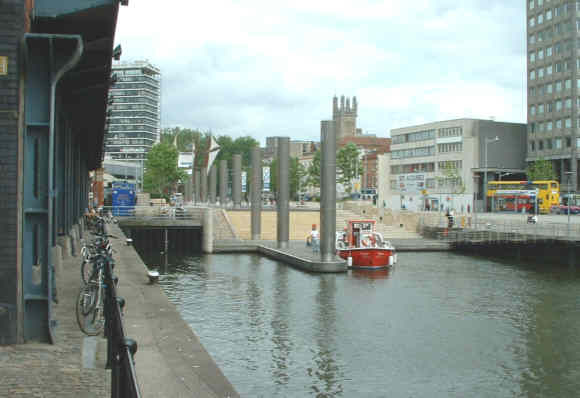 One side of Castle Park is alongside the Floating Harbour, this view is towards Counterslip with a shot tower in the background. 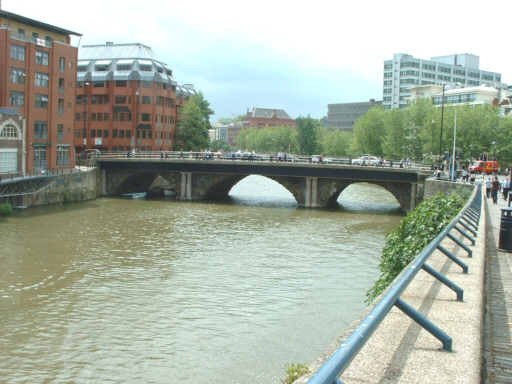 The other way is Bristol Bridge, the original purpose of the city. 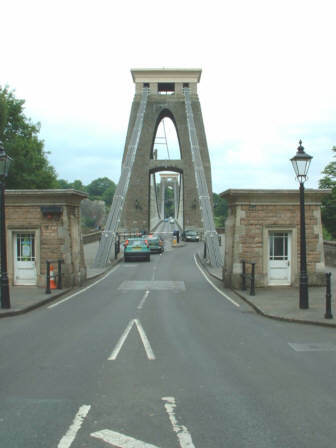 Brig Stowe is Anglo Saxon for Crossing Place, "L" was added to suit Latin grammar when a mint was established in the Middle Ages - was this the origin of the Bristol accent with its extra "L"s on words such as the Primal Donal at the Operal ? Looking across the bridge towards Welsh Back, the part of the docks that used to be used by ships going to and from Wales. 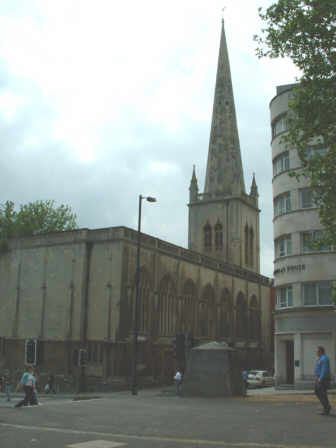 St Nicholas Church, near Bristol Bridge, is now a museum. 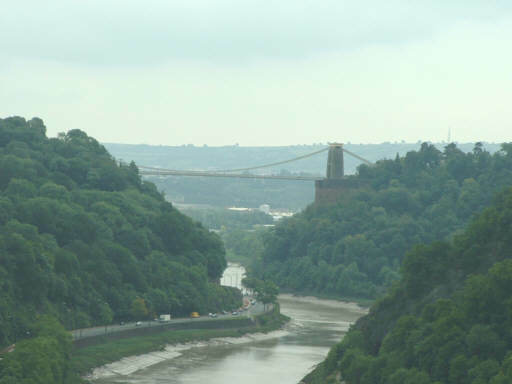 Another view of Bristol Bridge, this time from Welsh Back. Back to St. Augustine's Reach and another ferry making its way up to the centre. A view up the reach showing the Watershed on the other side. A fairly recent addition is this foot bridge over the reach, it does have a lifting section for larger vessels to pass. 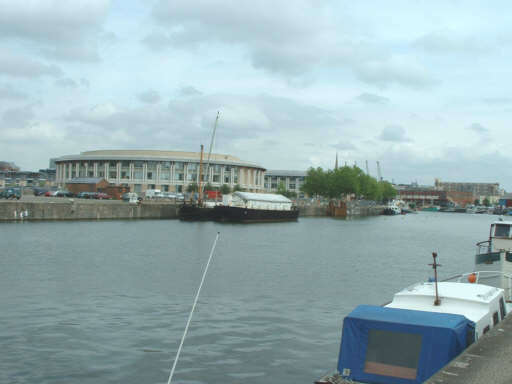 A last look at St. Augustine's Reach from outside the Industrial Museum, the office block on the right is the former Bristol & West Building Society HQ - now they have demutualised and sold out to an Irish bank it is no longer required. 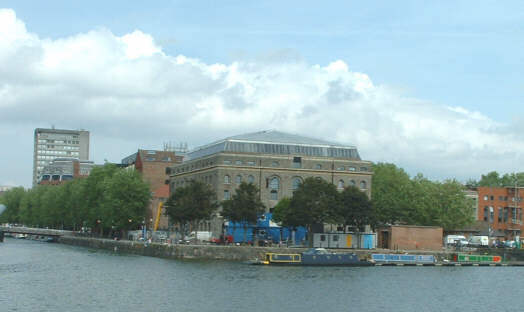 The Arnolfini Art Centre in a converted warehouse was one of the pioneers in revitalising the old docks. 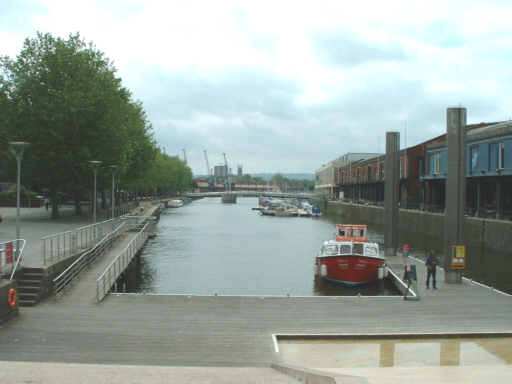 Looking down the Floating harbour proper towards the SS Great Britain with three ferries in view. 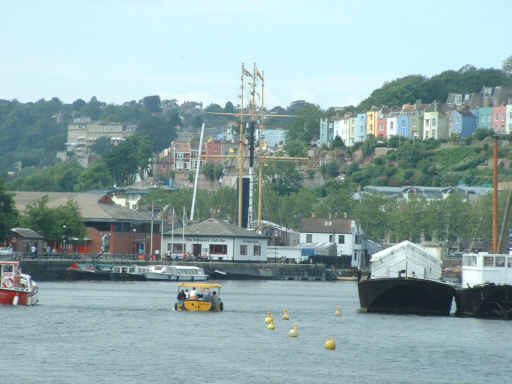 Zooming in on the SS Great Britain, and the colourful houses on the hillside. 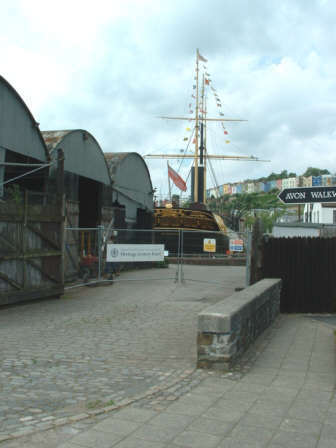 The brick building on the left is the Maritime Heritage Centre, well worth a visit. nearby is Ardman Animations where Wallace and Grommit were filmed! 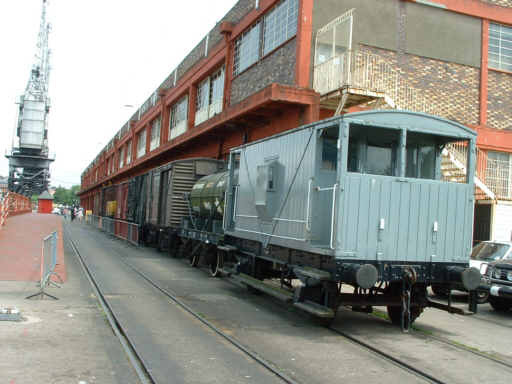 A collection of railway wagons outside the Industrial Museum, inside there are old cars, buses and motor bikes, plus a mock up Concorde cockpit, amongst other things, all made in Bristol. 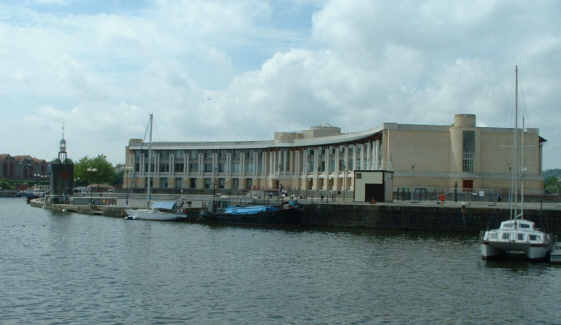 Lloyds Bank led the way with new development on Cannons Marsh with their headquarters buildings. 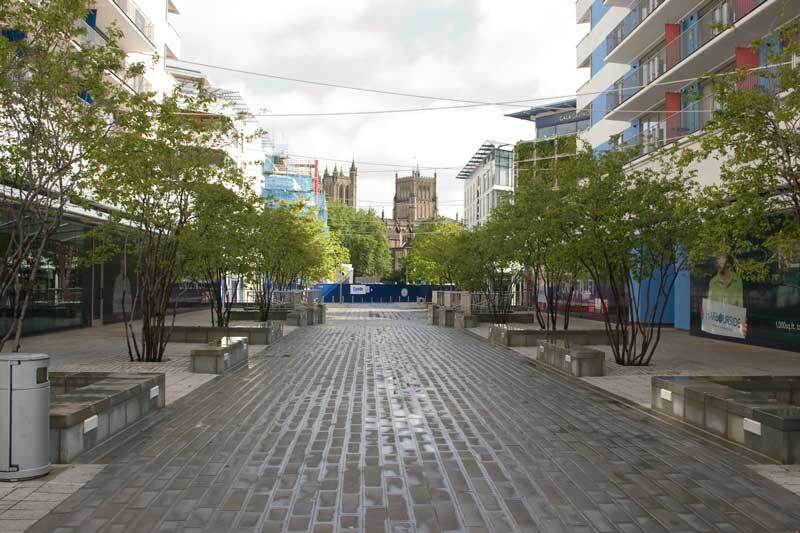 Another view of this development, much better than the large concrete tobacco bonds that used to stand on the site. 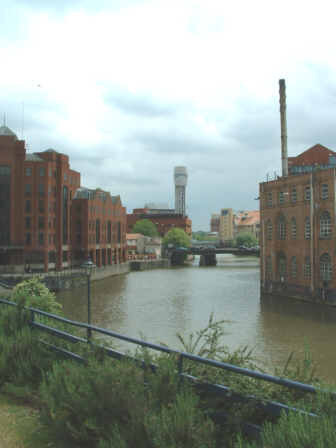 You get glimpses of the Cathedral from various places such as this from near the Industrial Museum. 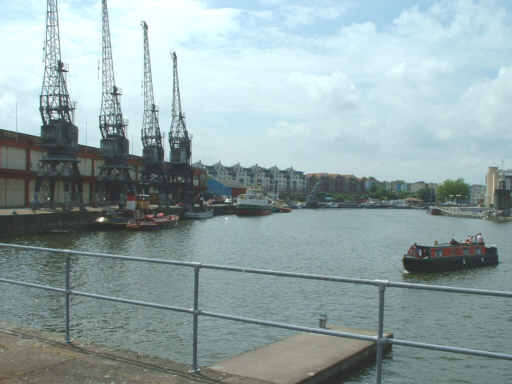 A better view from further down the Harbour, I hope the new flats being built in front of it won't block this view. 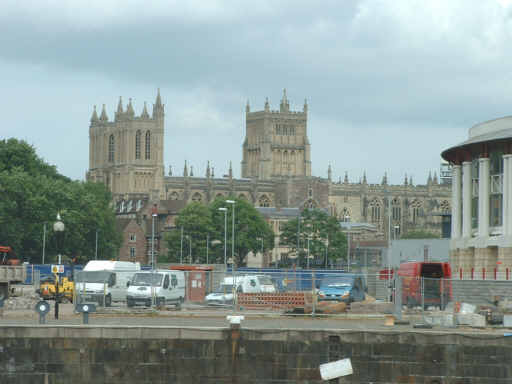 There is still a view of the Cathedral through the new development though I haven't investigated it from across the harbour. 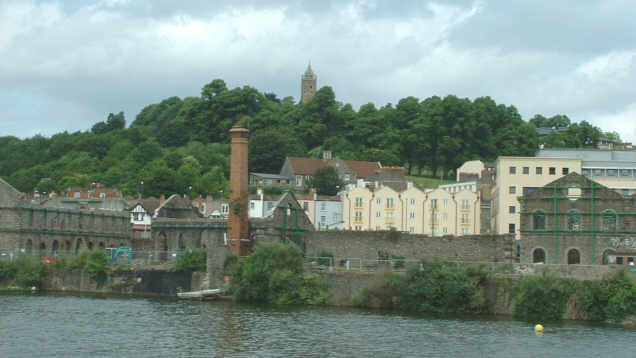 Another landmark is the Cabot Tower on top of its hill, the old gasworks in the foreground are going to be redeveloped at last. A zoom in on the tower, there's a spiral staircase inside it, quite a climb but worth it for the view from the top. The SS Great Britain, the first propeller driven steam ship in the world is preserved in the dock where she was built, at present she is largely covered while work is underway so this was the best I could do for a photo of her. 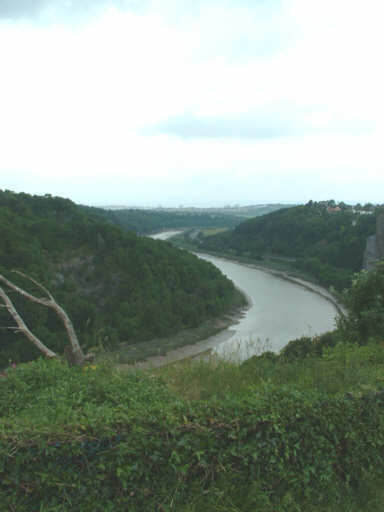 The view from Clifton Downs looking down the gorge towards Avonmouth and the sea. 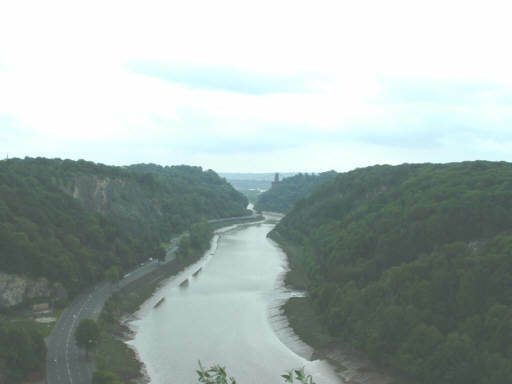 Looking the other way along the gorge to the Suspension Bridge and Ashton Vale. 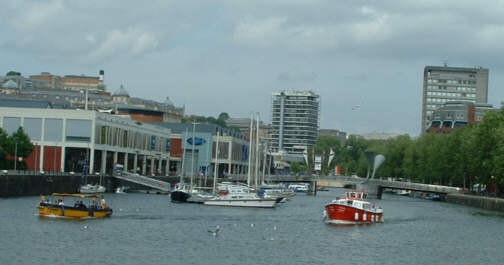 The Bridge is one of many of Brunel's works in Bristol, the docks themselves, the Great Britain and the original station at Temple Meads are others. 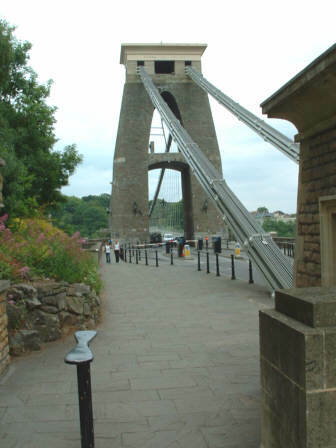 Zooming in on the Clifton Suspension Bridge, a pioneering structure that has come to symbolise Bristol in many ways. 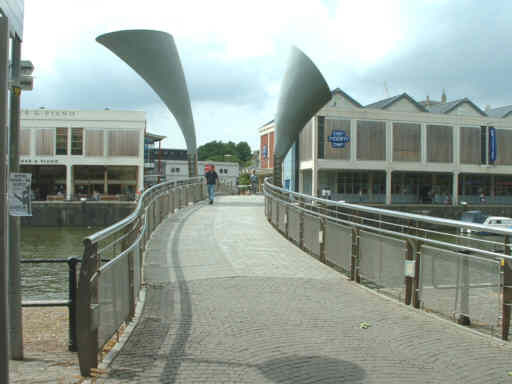 Looking across the bridge from the Leigh Woods (Somerset) side. The bridge is still a busy and important commuter route, the toll of 30p being well worth the time and fuel saved by not going the long way round. A closer look at the Leigh Woods side tower and the chains that the bridge is suspended from. 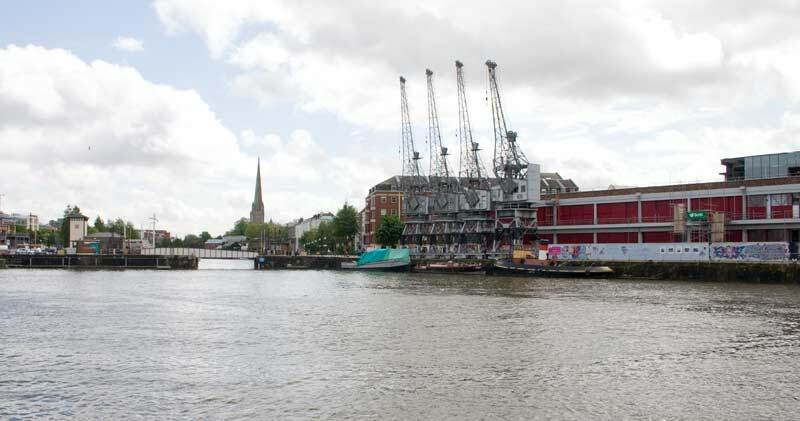 Due to financial difficulties when it was being built the chains in fact were second hand having previously been used on Hungerford Bridge over the Thames in West London.